This is a Signal compatible client for Sailfish OS, written in Go and QML. It builds upon the great Go textsecure package and modified versions of a minimalistic gui. 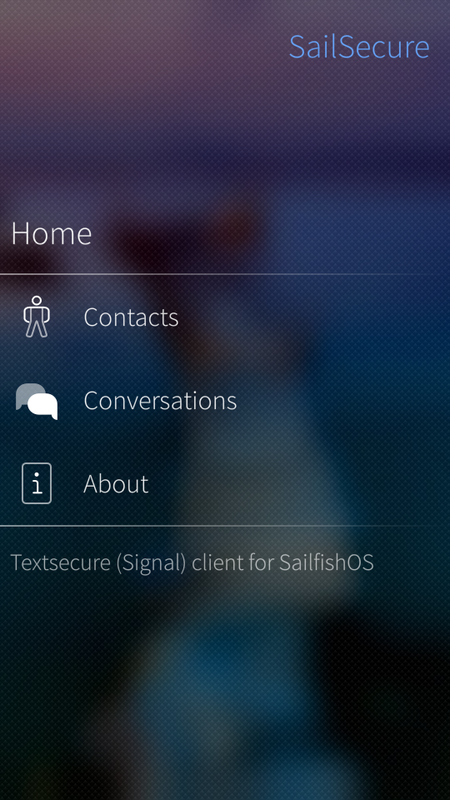 Some Ideas and concepts are taken from WhisperFish which is also a Signal client for Sailfish OS. This is a project in early stage. It works for me as a daily messenger. But don't expect it to be 'feature complete'! You have to restart the app when you leave a wifi and automatically switch to mobile data connection. Otherwise you won't get new messages. There are still bugs and UI/UX quirks. First release for Sailfish OS. Is this App stil under active development? I search for a native Sailfish app for signal and am a bit confused: was this app blocked because of it's former name or is it still blocked and discontinued? This project is stopped. Use open alternatives like xmpp! If you want to be dependent from OWS, have a look at whisperfish. I will stop this project - sorry. Open Whisper Systems has started blocking users of LibreSignal. It's just a matter of time until all other alternative clients get blocked. So I will not put more effort into this project. Instead, let's use realy open solutions in the future instead of depend on centralised services. I will investigate some time to get a knowledge what is missing on the xmpp implementation of telepathy to get a usable jabber client on sailfish os. 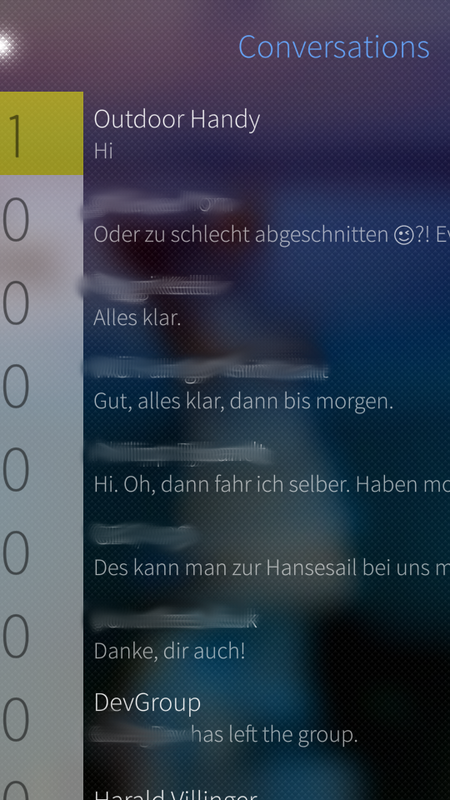 The existing messaging app is really a mess with xmpp. I found a decent alternative on Android called Wire (wire.com) which is open source and they promissed to open source the server also. we need a native client otherwise there is no alternative. For your information, Wire for Android is working fine with SailfishX v.2.1.3.5 and its associated Aliendalvik compatibility layer v1.0.63 (device: Sony Xperia X model f5121). Yes, the Android Wire App is working fine on the F5121. But received pictures are not displayed. Any idea how to solve this bug? Which Wire App Version are you using? You're right but I was mentioning wire as a posible port to SF not as is. At some point I saw already a wire client for ubuntu touch. Or just use delete from messages where sid=x , with x being the id of the session (~= conversations?) in the database. To remove the last message from the conversations screen, delete if from the sessions table too. Note to the author of this application: it's weird that you store messages unencrypted in a sqlite3 database if the application you are providing is all about secure chat. Just saying. Assuming I've understood the code correctly, these hex numbers should be prefixed by 05 in the Signal UI (apparently it identifies the key type). There is a lot of activity with WhisperFish, will you be integrated them soon? When I look at the github repo of whisperfish, there is no activity since at least three month. Is the project abandoned or dead now? If so, it would be nice if you continue with SailSecure. 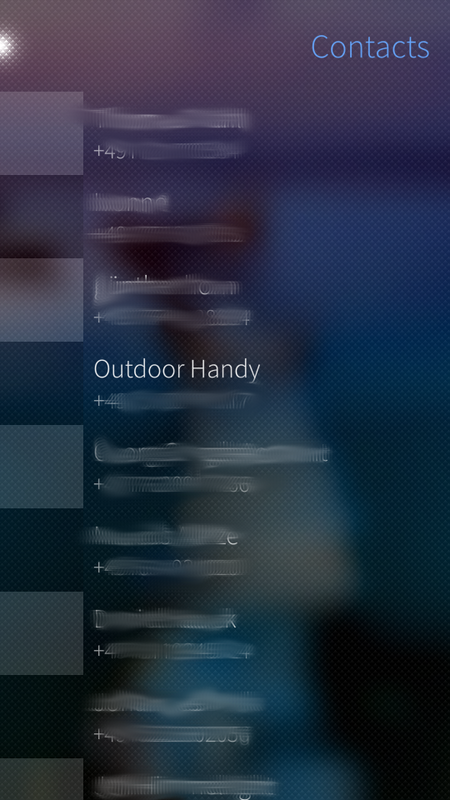 Here (SFOS 2.0.0.10 Saimaa), contacts don't show up (except myself twice). No option to add or import contacts. Got some similar feedback from other users. The App should try to 'correct' any phone number in your contacts. Sometimes, this seems to fail. Try to clean out all numbers in your address book of contacts which has a signal account. Number should be in E.164 format. Just one question: Does it upload all your contacts to Signal servers? If so, could this be optional? I was quite (unpleasantly) surprised to go to Contacts in the app and see some of my contacts from the phone there. It could at least ask the user to do so, as it's quite unfair to the people whose info has been uploaded. The Link from lkdhf describes the behavior with the contacts very well. SailSecure currently uses the same approach. Contacts (or hashes) from your phone are being send to the whispersystem server. The server replays with a contact list, who's number is also registered as an signal client. Of course, privacy would be improved if only selected contacts are send to the server. Please open a feature request on the github page of the project. Thanks for the link, but I don't think it is that relevant to my question, as it relates to the official client only. It would be a great privacy advantage over the official client if we could opt out of this data sharing. Instead, the app could have its internal contact db and only optionally import (or sync) device contacts. That way those who value privacy (which the target userbase of Signal should be) could be sending only the contacts they intend to chat with. I use already the Android-Signal-App, is it possible to use the Android registration for Sailsecure? I don't know how the credentials of the Android App are stored. Of course, it would be nice if you could dynamically choose which App to use (Andoid Signal Client or SailSecure), depending of one's need. Personaly I would not have any Android App's on my device. So I will not work on this topic. Thank you ! good start !